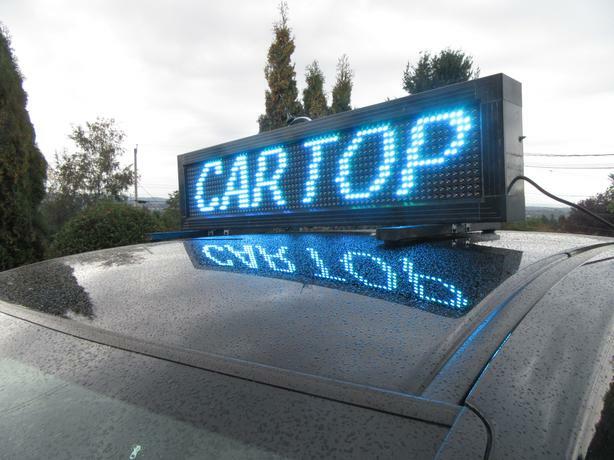 Portable all weather outdoor multicolour LED sign. Manufactured in Vancouver. Two years warranty. Easy to program as many messages as you like with any windows based PC. Determine the font, colour, shading, motion, effects, speed, hold time, on-off time, brightness upload images and more. Preview your messages in motion on your PC then send wirelessly directly to the sign. Software included. Very effective visual advertising, promoting, protesting, directing, informing, and entertaining. The sign requires regular 110V outlet to plug it in. It can also be powered by a vehicle's 12V power supply or 12V battery using a 160 watt power inverter. Please call 250 740 5110 with any questions for fastest reply.